Having finished construction of this little panzer, I was looking forward to proceed to painting. 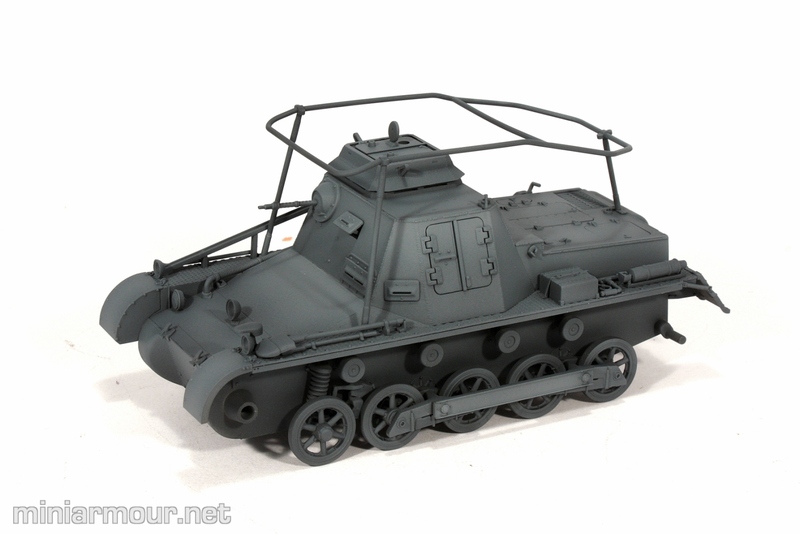 First was the primer, with the usual pitfalls with priming outside in winter – see my post on the Char 2C here. This was followed by the preshading/base coat and modulation. For preshading I have gone with the Tamiya German Grey and applied flat uniform coat. To add contrast and highlights and have mixed lighter version of this same colour. In most cases I avoid lighting paints with white as it makes them look bleak, but in this case I was looking to preserve the cooler tone of the German grey. I have applied modulation in two steps with two different paint mixes. First was mix of German Grey and Flat White in ratio 3:5 and then the second, lighter version mixed in ratio 2:5. This was only pplied along the upper edges of the superstructure and upper hull. I have used old business card to achieve hard edge between the areas of different lightness, mostly along the edges, such as between the front upper hull and front side of the superstructure, which is the most visible one. I have kept the lower hull area (behind the wheels) darker and applied the first lighter coat lightly.